First it was e-coli; now it’s dead bats. Is salad low-key dangerous? On Saturday the Centers for Disease Control and Prevention recommended that two people get postexposure rabies shots after one of them reported finding a dead bat in a Fresh Express packaged salad mix. CNN reports that the bat was sent to the CDC after it was found in a bag of Organic Marketside Spring Mix at a Wal-Mart in Florida. “The deteriorated condition of the bat did not allow for CDC to definitively rule out whether this bat had rabies,” the CDC said in a statement. Although the possibility of rabies transmission was extremely low, it is not nil. 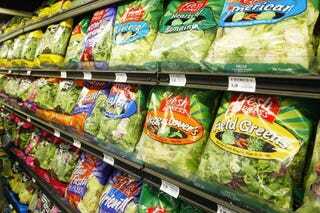 Fresh Express has recalled packages of the salad mix that were sold at Wal-Mart stores in Alabama, Florida, Georgia, Louisiana, Mississippi, North Carolina, South Carolina and Virginia. The affected product has the production code G089B19 and best-if-used-by date of Apr 14, 2017, on the front label, and UPC code 6 8113132897 5 on the bottom of the container. On Sunday morning, “Fresh Express” was trending on Twitter, with a few users none too pleased about this distressing bit of news.